AMSTERDAM — A 270-year-old menorah became the most expensive artifact of its kind sold in the Netherlands in recent memory after it fetched $441,000 at auction. The menorah, which belonged to the family of a Dutch Jewish resistance fighter killed by the Nazis, was sold last week by the Venduehuis der Notarissen auction house in The Hague to an unnamed Jewish collector, the Omroep West broadcaster reported. Manufactured in Amsterdam in 1747, the menorah, which used to be part of the collection of the family of George Maduro, triggered an international bidding war that caught the auctioneers unprepared, according to the NOS broadcaster. The object in question was estimated to sell for anywhere between $9,000 and $15,000. Dozens of telephone calls came in with bids for the menorah, forcing the auction house to divert all available manpower to deal solely with that sale, Meefout said. George Maduro, who during World War II helped smuggle stranded British pilots from continental Europe back to Britain, joined the resistance after the Nazis invaded the Netherlands. He was caught and sent to the Dachau concentration camp where he died just three months before its liberation. To commemorate their only son, Maduro’s parents financed the construction of one of Holland’s best-known tourist attractions: The Madurodam miniature city, which opened in 1952. According to Omroep West, there is but one known piece that is identical to the Maduro menorah, which is part of the collection of the Dutch Royal House and is currently on display at the Jewish Historical Museum in Amsterdam. 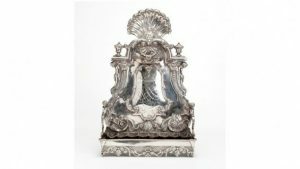 The Maduro menorah was the single most expensive item in the auction of the silver and porcelain collection of Rebecca D. Maduro, George Maduro’s mother, which the Venduehuis der Notarissen auction house concluded selling on Friday.